Can These Plastic Eating Wax Worms Help Reduce Our Trash? Though plastic bags are incredibly cheap and useful for all of us, their disposal causes extensive pollution. This is because of the non-bio degradable polyethylene that takes centuries to decompose and is also harmful to wildlife who often mistake the colorful debris for food. Now, we may have an unlikely supporter to help clean up our trash - but, a small wax worm breed that is primarily used as premium fish bait. Each year, the world produces around 300 million tons of plastic, much of which resists humiliation and ends up polluting every corner of the globe. However, the team of experts from European scientists has found a unique solution towards this plastic problem. They discovered that a common insect can chew extensive holes in a plastic shopping bag within 40 minutes. While this study is another milestone discovery for the researchers on biodegradation of plastics. The discovery was led by Federica Bertocchini, a developmental biologist at the University of Cantabria in Spain; and she was the first person who noticed the possibility as she cleaned out her backyard bee hives two years ago. While doing the task, Federica removed some wax worms, called Galleria Mellonella, living in the hive and placed them in an old plastic bag to see what they could do. 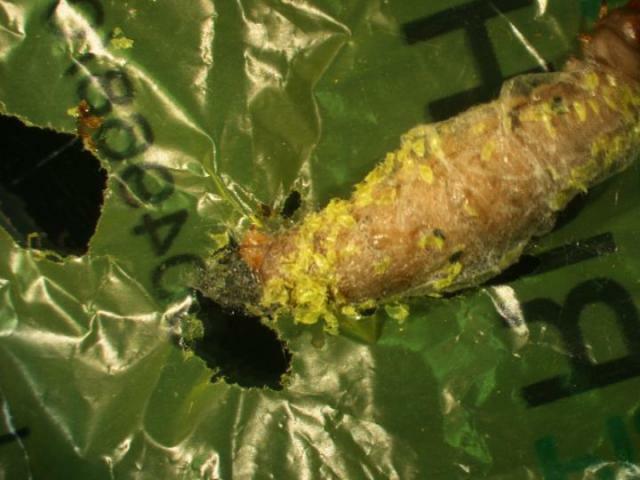 To her surprise; when she checked the bag an hour later, she discovered small holes in the part of the bag with the larvae. Though Bertocchini wasn’t an entomologist, she guessed right away what was happening. The larvae form of a small moth, wax worms get their names because they live on the wax in bee hives. Like plastic, the wax is a polymer, which consists of a long cord of carbon atoms held collectively, with other atoms branching off the sides of the sequence. But, both wax and the polyethylene in Bertocchini’s plastic bag had a related carbon backbone. Bertocchini has teamed-up with his fellow scientists Christopher Howe and Paolo Bombelli to figure out how these wax worms were pigging out on plastic. 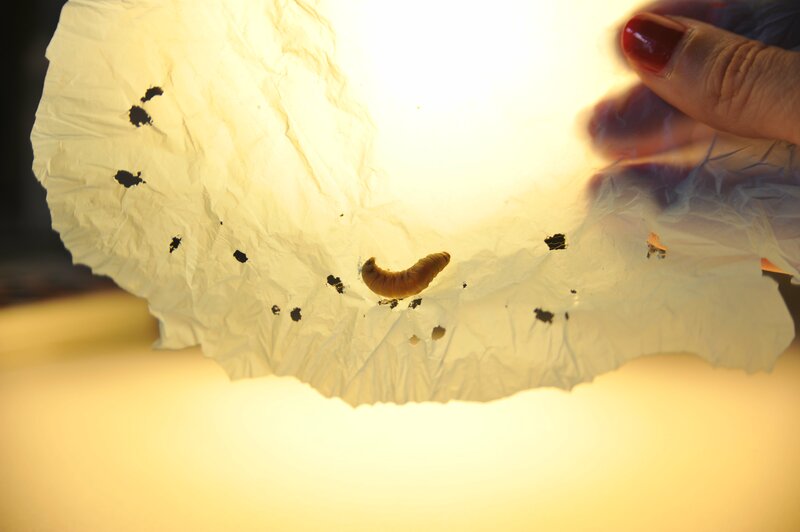 First, they have placed some worms on polyethylene plastic and found that each worm created an average of 2.2 holes per hour, and by overnight about 100 wax worms degraded 92 milligrams of a plastic shopping bag. If you see, by this rate 100 worms nearly in a month can completely break down an average, 5.5 grams of a plastic bag. To rule out this munching action from their jaws as the source of degradation, the team applied a soupy blend of recently dead worms to the plastic and waited. Sure enough, they found the liquid larvae could also eat holes into the plastic. This told Bertocchini and colleagues that an enzyme in the worms or the bacteria living in and on their bodies can also dissolve the plastic. That enzyme transformed polyethylene into ethylene glycol, which is a chemical commonly used in antifreeze. Bertocchini hopes to identify the exact enzymes that break down polyethylene in their future work.